1. Thank you all for the suggestions on what to do with my many, many peaches. I don't know why I never thought to freeze some, but several of you suggested that and it was a brilliant idea. 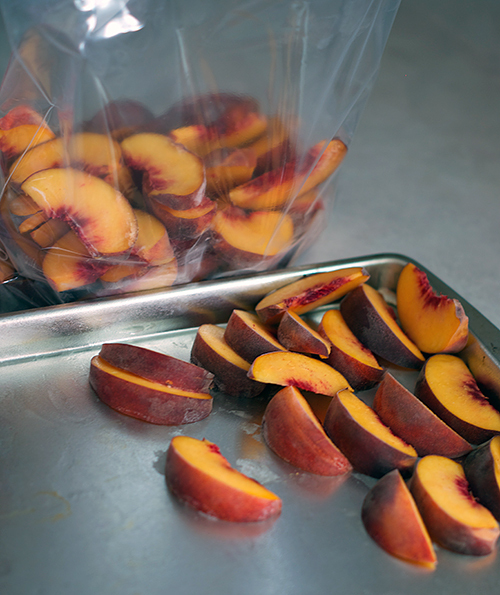 I cut them and laid them out on a cookies sheet to freeze for a few hours before transferring them to a bag. Hopefully that will prevent them from freezing into a solid mass but I'll keep you posted. Looking forward to some peach smoothies this winter! 2. I also tried my hand at making fruit leather, and it really is easy. It also disappears disappointingly fast. After something bakes in the oven for 6-8 hours, you kind of want it to make so much you are swimming in it for the next few days. The peach leather is delicious, but I want twice as much of it next time. For those who are interested in making some on their own, just blend about 3 cups of fruit in a blender or food processor, add a pinch of salt and honey, agave or other sweetener to taste, pour on a parchment- or silpat-lined baking sheet and bake as low as your oven goes (mine was at 170) for 6-8 hours. Make sure you set a timer so you don't forget it in there! 3. Meet the newest member of my cookware family. It's a 15" cast iron skillet. I put the measuring cup in it so you could get an idea of scale. It is basically huge. I think I need to put stickers in our windows warning potential thieves that we have a deadly pan inside. Trust me you wouldn't want this thing coming down on your noggin, though I'm not even sure I could swing it much about my shoulders. Luckily we've only had to use it for cooking, and it is awesome. I avoided cast iron for a while because I've always been afraid of the whole idea of seasoning it and not ruining that seasoning, but so far it's been really easy. It came preseasoned and was fairly non-stick to begin with. I'm excited to try out some deep dish pizza in it. In fact, I get all giddy just thinking about it. I'm such a food nerd. 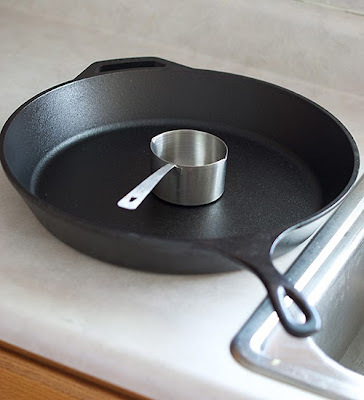 Do any of you use cast iron? What is your favorite piece, and how do maintain it? 4. I know I'm the last person on the planet to try this, but the New York Times No Knead Bread recipe is really just as magical as everyone says it is. That is all. I've been wanting to get a cast iron skillet but have such a hard time making decisions on which one. Which did you go with?? I got a Lodge skillet. They come preseasoned and their cast iron is made in the US. I've been happy with it so far. I had heard vintage skillets were the best, but honestly, unless you stumble across one in a yard sale, getting one seems more expensive than I thought it was worth, especially since I wasn't sure how I'd like the whole cast iron thing. On Amazon the Lodge skillets are fairly inexpensive. My 15" was around $36 and a 12" is around $20. Let me know if you get one and how you like it! I have a 10" cast skillet and love it! Also was preseasoned when I bought it. I only use super hot water and a brush to clean it, then dry it well. In the beginning, I would put a light coat of oil on it between uses. 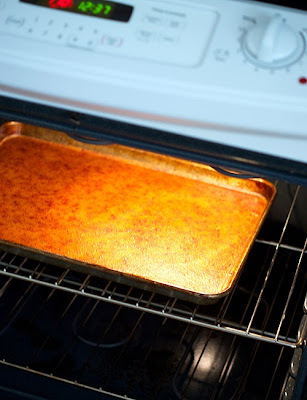 I store it right in my oven, and just take it out when i need to use the oven or the pan. it's small but like you said, heavy, so in the oven is a good place to store it. Cast really conducts heat well, so when you need something really browned, its the go to pan to get you there. BTW...mine is a Logic so not very expensive. YUM definitely trying that fruit leather!